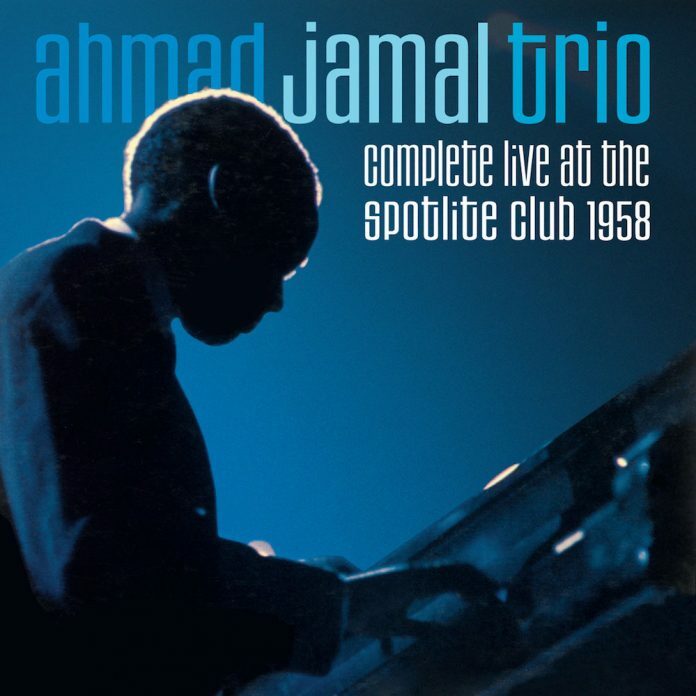 The press release tells us that this two-CD edition contains all of the known material from the Jamal Trio’s Spotlite performances, plus three rare studio tracks (bonus tracks) from the same period. In fact, the studio tracks are from the same year, but recorded in Chicago as opposed to Washington. The overall programme effectively makes for two substantial full-length live sets, plus the three bonus studio tracks at the end of CD2, and it’s comprised almost entirely of standards with a small sprinkling of Jamal originals. There’s a 12-page booklet with the CD package, including photos, a discographical note from Martin Font, and notes from John Hammond. So what does it sound like? Well, let’s look at it in two ways, firstly in terms of the playing. It’s a fascinating trio, which in terms of interaction between the musicians and a greater sense of musical space, predates Bill Evans’s Portrait in Jazz (1959) and his follow-ups. The modern, more arranged, and even contemporary jazz piano trio of today is effectively already in shape in the form of Jamal’s trio. It’s also a very dynamic group, exploring everything from the most delicate to the suddenly loud. This brings me to the second way of looking at how this album sounds – the recording itself. The live recording, which represents all but eight minutes or so of the whole two-CD set, isn’t of great audio quality. Yes, it’s from 1958, but there are some pretty good examples of live recording from that time. There are the usual extraneous noises that we’ve come to associate with live jazz albums of that period, like glasses chinking and cash registers ringing in the background, but that’s the nature of the beast. However, given that Jamal’s piano-playing is often so delicate on these recordings, I have to say that the drums are often far too loud in the mix, particularly in the higher frequencies in the cymbals, and at its most extreme in the snare “cracks”. This may well be inherent in the original recordings that were issued as singles (and are long since out of print), and these mix problems may have been further exaggerated in the digital remastering process for this new release. With this in mind, as I listened to the album, I looked forward to hearing better audio quality from the three studio tracks at the end, however, although the piano is better recorded in these cases, the overall sound still isn’t all that great. Jamal (p); Israel Crosby (b); Vernell Fournier (d). Washington and Chicago, 5-6 September 1958. "...a fascinating trio, which in terms of interaction between the musicians and a greater sense of musical space, predates Bill Evans’s Portrait in Jazz".